The ramekins are oven, microwave and dishwasher safe. Just put them in the dishwasher once you are done using them for a quick cleanup. High-quality porcelain material offers superior resistance to impact and temperature changes. Enjoy your ramekins for years to come without chips, scratches or cracks. 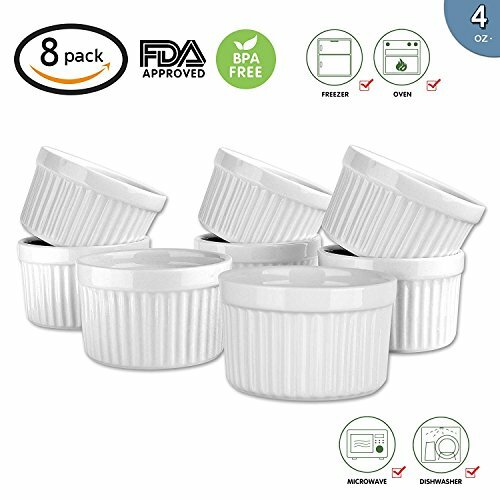 1.Each ramekin measures 3" in diameter and 1.85" in height. 4.Excellent for creme brulees, salsa, sauces, desserts, souffles, and more! PERFECT SINGLE SERVING SIZE - MAMA-AI-2018 ramekins are versatile dishes for souffle, creme brulee, jams, dipping sauces, french onion soup, blueberry crumble, drawn butter, olives, quiche and ice cream. And It is the right one and let everyone enjoy delicious food without worrying over-eat! BRIGHT WHITE COLORING - MAMA-AI-2018 porcelain ramekin dishes have industry-favorite traditional contours, ideal for various dining environments, from casual to the white tablecloth. Sleek ramekins are sure to create a dining experience your guests won't soon forget. If you have any questions about this product by MAMA-AI, contact us by completing and submitting the form below. If you are looking for a specif part number, please include it with your message.